Whether you’re a teacher with a few weeks off to enjoy the summer, or trying to fit in several weeks of vacation for a little bit of home maintenance while the weather is warm, summer is a great time to take on a few of the DIY projects that have been lying around. 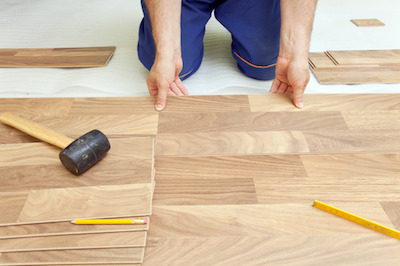 When it comes to a home renovation project, nothing makes as big of an impact as new flooring. But some flooring may be the perfect choice for a DIY project … and some may not. Bad flooring installation not only looks bad, but it also wears bad as well. And if you hope to see your home sell in the near future, it can also cause a serious hit to the value of your home as well. Looking for the perfect flooring to install yourself? These are the top choices for you to consider. If you want the natural beauty of real wood flooring, but not the hassle of sanding, finishing and regular maintenance, it’s hard to beat engineered wood. Engineered wood comes in wide, long planks that snap together with milled tongue and groove joints. There’s no gluing or nailing. The planks simply float over a thin underlayment. Engineered wood comes in a variety of styles, sizes, and colors. You can have everything from traditional oak to exotic Brazilian Cherry, or something in between. Resilient vinyl sheet flooring has been around for decades, and is still a popular choice for kitchens, bathrooms and laundry rooms. Over the years, the product has also become DIY friendly. Today, you’ll find floating vinyl sheets that are much thicker and more durable than standard vinyl. It’s as simple to install as removing the molding from around the room, cut and lay the vinyl into place, and replace the molding once again. With small rooms below the 12 foot wide mark, no seams will be required, meaning DIY installation is a snap. Laminate flooring is similar in many ways to engineered wood. Both are floating floors made from tongue and groove planks that snap together. Both come in a variety of styles, sizes, and looks. The main difference is the surface of the flooring is laminate instead of wood. The biggest advantage laminate has over engineered wood is that it’s extremely resistant to stains, scratches, fading, damage and wear. Which makes it the perfect choice for your main living areas with a lot of heavy foot traffic. The popularity of cork flooring has grown exponentially in recent years. Cork is attractive, durable and 100 percent renewable, since it’s harvested from the bark of live oak trees. It also is soft underfoot, and can provide noise reduction commonly associated with laminate flooring. Prefinished cork flooring comes in both tiles and planks. While some require glue to hold it in place, new products also offer planks that simply snap together to create a floating floor. And because it readily accepts stain and topcoat finishes, the color and pattern options are many. What flooring will you choose for your DIY project? We can help you make the perfect decision for your home, and get you started with all the supplies you’ll need.